The last round of the Reno Far West Open featured some great fighting chess, a nice change of pace from the drawfests that one often sees in the last round of big-money Swiss system tournaments. Both of the games on the top two boards were decisive. On board two, Melikset Khachiyan defeated Enrico Sevillano to reach a score of 5-1. This put the pressure on Mezentsev and Zierk, who had started the round at 4Â½-Â½. In case of a draw, there would have been a three-way tie for first and a speed-chess playoff to determine the champion. However, it was not to be. Zierk cold-bloodedly refuted Mezentsev’s attack and took clear first place with 5Â½ points. His payday was $2000. It was great to see Zierk performing so well. I just can’t believe the progress he has made in five years, from the 2000 player whom I should have beaten a few years ago, to the 2200 player I was happy to draw with a couple years later, to the 2300 player who stunned Loek van Wely in this tournament a couple years ago, to the 2500 player of today who mows down one opponent after another with calm assurance. The great thing about Steven is that he’s such a friendly guy. He doesn’t seem overly impressed with himself. He is all smiles before and after the game. Another thing about him is that he just can’t get enough of playing chess. I think that’s part of his secret. When he’s faced with a complicated, tactical, dangerous position, he doesn’t seem the least bit flustered. He’s right at home in any tactical position, just like a fish in water. A great example is this crucial position of his last-round game against Mezentsev. Mezentsev is playing White, and it’s his move. White has some dangerous-looking threats on the kingside, and he plays what Rybka says is the best move, 1. f5!? 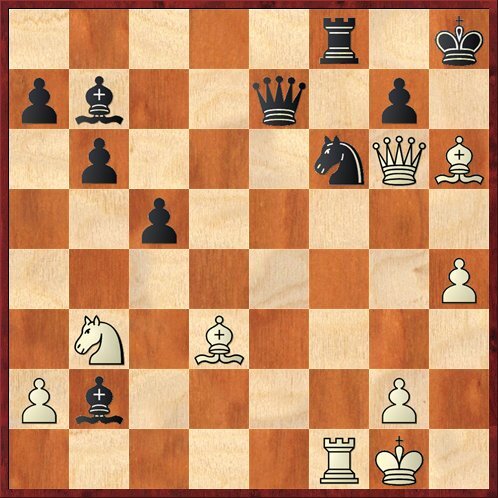 Rybka thinks that White is a half-pawn up here. Yet Black gets the best of it, and it’s hard to see where White went wrong, if anywhere. I have to think that Zierk outcalucated Rybka in this position. Anyway, Steven played 1. … ef 2. Bxf5 Bxe5! An unbelievable move. It looks as if Black’s king is about to be mated, and he defends himself by walking into a pin against his queen! But amazingly, all the tactics seem to favor Black. Two very important ingredients are the “sleeper bishop” on a6 and White’s hidden back-rank weaknesses if he tries to move either of his rooks. For example, if White plays 3. Rxd5? Black wins with the scintillating 3. … Bd4+ (threatening mate on e1) 4. Be3 (the only way out) Qxe3+!! 5. Rxe3 Bxe3+ 6. Kh1 Rxd5. White dare not move his bishop because of back rank mates, but the bishop is just hanging otherwise. Haven’t had enough yet? One of the spectators suggested 3. 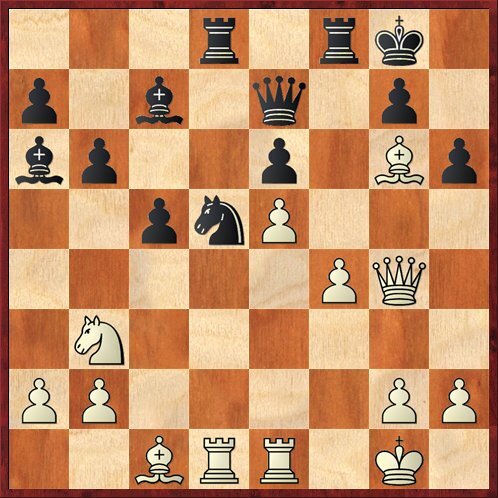 Be6+ after the game, with the idea of winning the bishop on e5. But this, too, fails to 3. … Kh8 4. Rxe5 Nf6!! (now the weakness of the rook on d1 is key) 5. Qf3 (only square for White’s queen) Nd7! and everything is hanging. Rybka does come up with the move 6. Bg5! here, which I’m not sure if Zierk saw. 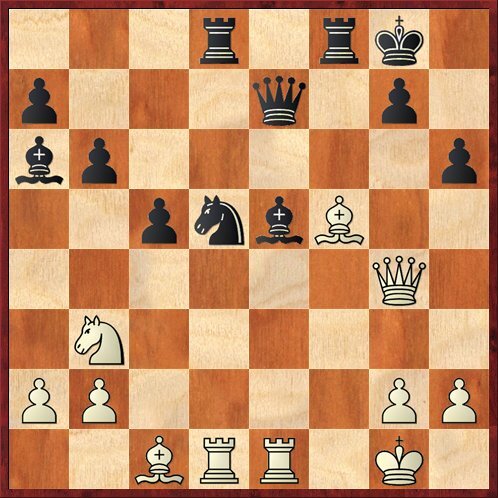 If Black takes the bishop then Qh3 is mate. But after the cold-blooded 6. … Qe8! the computer says that Black is still up by 0.88 pawns. This position is a great illustration of Zierk’s style. I would never have had the courage to play a move like 2. … Bxe5. The analysis is so tricky and I would have been scared of missing something. But Steven is never afraid. Would a fish be afraid of water? Mezentsev was as flummoxed as the computer is. He now played 3. Qg6, but Steven simply replied 3. … Nf6. (This is why it was important to get rid of the e5 pawn.) Now Mezentsev played 4. Bxh6 and it still looks dangerous — Black now has to worry about mates on g7 as well as h7. But no problem — he just snatches another pawn with 4. … Rxd1 5. Rxd1 Bxb2! Once again, notice White’s back-rank problems. He can’t play 6. Rd7 because of … Qe1 mate. Here I’m not 100 percent sure of what happened, because the post-game analysis was going so fast, but I think that Mezentsev played 6. h4 (finally creating a flight square) 6. … Bb7 7. Rf1 Kh8! 8. Bd3. The move order may not be right, but I think this is the correct position. Here Steven calmly plays 8. … gh. As he laconically commented after the game, “He’s threatening 9. Rxf6, so I have to take the bishop.” (The point being that this opens up the seventh rank to defend the mate on h7.) Again, I have nothing but awe and admiration for this move. If I even saw the threat 9. Rxf6, I would be petrified. But Zierk sees that he can eat the material and survive. After 9. Qxh6+ Kg8 10. Bc4 Rf7 Black’s king, even without any pawn shelter, is perfectly safe. I’m not completely sure, but I think the game then went 11. Bxf7+ Kxf7 and Black is winning. Black’s two bishops dominate the rook in the endgame, and Steven won in a few more moves. As for my result, the less said the better. I drew another class-A player and finished 3-3. The tournament that began so promisingly for me ended with no prize money and I may have even lost a few rating points. I didn’t really have winning chances in either of my games today, only if my opponents had really screwed up (which they didn’t). Yeah Bxe5!! I wish I played move like that once or twice in my life time. 🙂 Some moves that kind of make sense in seeming chaos exhilirate me. In this and I guess many other regards I still cherish the Nxc6 in McShane – Carlsen London classic. I’ve finally gotten to play over the whole game, which is at Steven Zierk’s brand-new blog that you should check out: http://www.zierkchess.blogspot.com. 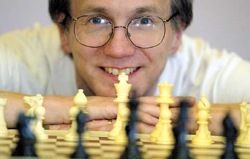 Interestingly, Steven comments that this tournament had “some of the sharpest games I’ve ever seen.” So maybe the tactics were unusual even for him. A couple of minor corrections need to be made to the score above, none of them fundamentally affecting the game. “Move 1” was actually move 29 in the game. 3. Qg6 and 4. Bxh6 actually happened in the opposite order. 6. … Bb7 was actually 6. … Bc8, and so of course the moves 7. Rf1 and 8. Bd3 happened in the opposite order. And finally, White didn’t play 11. Bxf7 right away; he played 11. Qd2 and didn’t take on f7 until a couple moves later. Sorry about all the little glitches. As I said, the moves went by me really fast during the post-game analysis. Fact is, I thought I did pretty well even to memorize the initial position correctly in the 30 seconds or so that I got to see it.